Cody C. Branham | Adams Jones Law Firm, P.A. 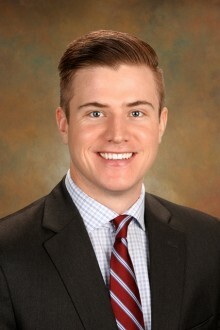 Cody’s practice focuses primarily on real estate and commercial law. A native of Great Bend, KS, Cody received both his bachelor’s degree and juris doctorate from the University of Kansas. While attending KU, Cody worked for a Lawrence-based financial advisor helping client reach their financial goals. During law school, Cody served as Symposium Editor and Articles Editor for the Kansas Journal of Law & Public Policy and obtained a certificate in business and commercial law. Cody also worked for Student Legal Services at the University of Kansas, assisting fellow students file their tax returns. Outside of work, Cody is active in the Wichita community, serving on the Event Planning Committee for the Rotary Club of Wichita. Cody is also a member of the Wichita Bar Association and Kansas Bar Association. · Stuck in the Middle: Curbing Income Inequality with the Better Bargain Plan, 25 Kan. J.L. & Pub. Pol’y 187 (2016).